New York (CNNMoney) – The Obama administration on Monday turned up the heat on Congress to raise the debt ceiling. 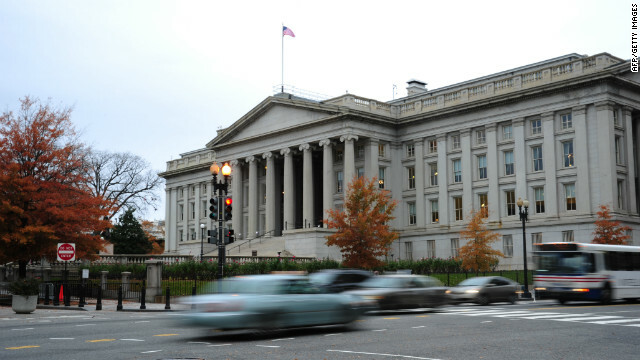 The Treasury Department, hours after President Obama again said he would not negotiate with Congress over the issue, said it will run out of ways to keep the country under the legal borrowing limit sometime between mid-February and early March. They use the "N" word... NO !!! Guess you forgot this nation's majority vote went to Obama and elected him President – twice. Funny thing facts. Citigroup (C, Fortune 500) and Morgan Stanley (MS, Fortune 500) have already announced new job cuts, and analysts predict other large banks will follow suit, as they seek to slash costs in the wake of declining revenue. good work obammy !!! MORE LOST JOBS, THANX FOR NOTHING !!! America is about to find out obama is not as powerful as he thinks he is...he is what he is a second rate law school lecturer and community organizer... He lied to get elected and reelected, lied in his books, and stands before us daily lying and manipulating.... real righteous men don't lie, they don't have to. The funny thing is, he does not need the power nor does he want it. If members of Congress wants to strangle the country by not paying the bills they owe then they should go ahead and sign their own death warrants while they are at it. take off those rose colored glasses. My glasses make me see better these days and no, they are not rose colored. I think yours is making you see nothing but bitterness and hate. What color are those? I know 20 year olds that have more fiscal discipline than a great number of our politicians from both sides of the aisle! President Obama should issue an executive order overriding Congress entirely in regards to the debt ceiling, just so we can all enjoy watching the republicans heads explode.